This month, we had the filter in our airconditioner and heater inspected to make sure that it is clean and in good working condition. This is very important in order to keep the air that circulates around the house clean, thus, preventing respiratory problems and allergies. Also, a filter in good condition uses less energy. The same goes with furnace filters. It is a must that they must be kept clean. Make sure that dust does not accumulate because when the system gets clogged with dust and other airborne particles, it will cause the motor to work harder, using more energy, which translates into higher electric bills. 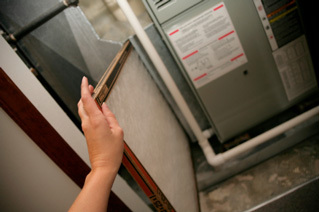 A dirty filter can also contribute to overheating in the system which is dangerous.